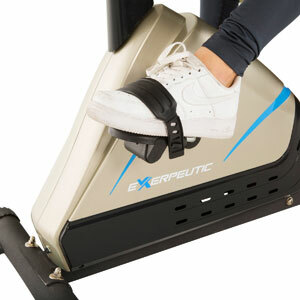 Exerpeutic actually offers two exercise bikes under the “2000” number, but one of them is upright, the other is recumbent. This post addresses to the Exerpeutic 2000 recumbent bike, the part number 1112. This Exerpeutic recumbent bike, although it’s not a model with all the belts and whistles, so far benefits mostly from 4-5 star reviews from many users all over the world. It’s an exercise bike that offers excellent ergonomic factors, such as an AirSoft cushioned seat, also integrating cushioned armrests and back support. Now, in case you’ve already set eyes upon this recumbent bike model, we’re pretty sure you would like to know as much as possible about it. Therefore in this post we’ll cover in detail each and every one of its features and functions. The bike’s main chassis is made of two parts that connect at the middle. Naturally, the rear part integrates the seat assembly, while the front part holds the resistance system, drive system and console. The two frame parts come attached together via two bolts, the connection being quite solid. In other words, this bike won’t wobble at the middle, like other models with a 2-parts frame. Most of the bike’s frame is made of steel bars, coated with black, anti-corrosive and scratch resistant paint. The brake and drive mechanisms are shrouded by plastic covers though. The assembled bike is not extremely large. Its footprint is 54″L x 22″W (137 x 56 cm). However, its total width is given by its handgrips, the distance between them being approx. 36″ (91 cm). This being said, it’s best to assemble it on the place where it’s going to be in use. This Exerpeutic bike does not have a folding frame. However, it doesn’t weigh that much. With an assembled weight of 63 lbs (28.5 kg), just about any person should be able to move it. Plus, its rear base incorporates small transport wheels, to facilitate the bikes transport. The bike’s bases do not feature adjustable stabilizers. They have plastic, round caps. Thus, if the flooring or pavement where it will be in use is not even, it’s best to place it on a mat, in order to achieve maximum stability. On the other hand, the bike is well-constructed and shouldn’t wobble under the user’s weight. It has a maximum weight capacity of 300 lbs (136 kg). Evidently, the most important comfort factors integrated by this Exerpeutic bike are its seat and handlebars. The seat is made of 3 1/2″ (8.8 cm) thick foam material, and it also integrates multiple individual air chambers, which act as shock absorbers, and distribute the user’s weight evenly. They also ease the airflow underneath the user, in order to prevent the overheating of the seat’s surface. The seat exterior material is a synthetic leather type, with a honeycomb mesh structure on the sides, and a soft PVC weave at the top. 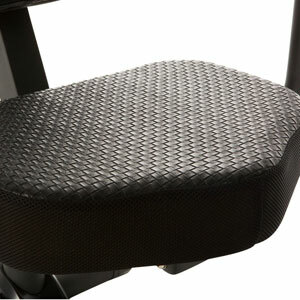 The backrest is also cushioned, offering maximum comfort. The Exerpeutic 2000 recumbent bike doesn’t have front handlebars. However, it focuses on offering as much comfort as possible with its recumbent handlebars. These integrate cushioned armrests, feature that many other recumbent exercise bikes don’t offer. Therefore, to put it simply, the bike’s seat provides the comfort of an armchair. The handlebars are finished with rubber foam covered grips, which integrate pulse sensors. In other words, the bike’s console can track your pulse. The seat is two-way adjustable. It is attached to a sliding rail which can be moved closer or farther in relation to the console mast. It cannot be adjusted height wise (up/down). There are 7 adjustment holes on the seat’s bar, the bike being able to accommodate comfortably, users between 5’3″ and 6’3″ (160 – 190 cm). The seat itself is 16 1/2″ (approx. 42 cm) wide, it stands 21″ (53.3 cm) above floor level, while the distance between the arm bars near the seat is approx. 20″ (51 cm). However, as we’ve mentioned above, the arm bars are not parallel, the distance between the grips being 36″ (91.4 cm). Finally, the backrest’s position cannot be adjusted. But since it’s welded to the seat bar, it will evidently glide back and forth with the seat, when you adjust its position. 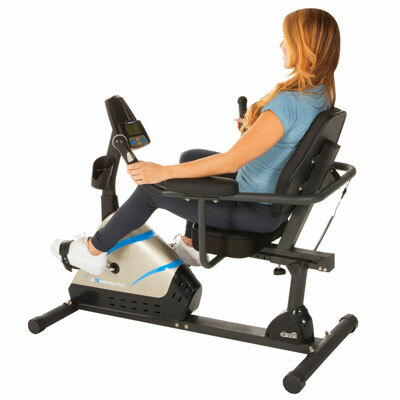 Exerpeutic 2000 High Capacity recumbent bike features a smooth and quiet belt drive, which basically doesn’t require any maintenance. It uses a v-belt type, highly resistant to stretching, and a balanced flywheel for a steady pedaling motion, with a consistent momentum. The bike’s pulley is finished with steel crank arms, while pedals feature a ribbed design, integrating adjustable straps. Pedals also have standard threads, and in case you want a different model, you should be able to easily find a replacement. Pedaling backwards is possible on this exercise bike. And while reverse pedaling, resistance is kept. Also, the values continue to be monitored on the console. This Exerpeutic bike model features a magnetic resistance system, assisted via a small motor. This being said, the resistance of the bike is adjusted from the console. There is no manual adjustment knob, as for other bike models like the Sunny SF-RB921, or Marcy ME 709. Also, the bike requires to be connected to a 120-volt nominal power circuit. It comes with a 120V in / 6VDC 1000mA out adapter, with a standard US plug. The bike offers 8 levels of resistance. The lowest, 1-3 levels are pretty light, great for users who must follow a recovery training regimen, or elderly users. The top 7-8 resistance levels on the other hand, offer quite a challenge and can help you break a sweat, tone leg muscles and put your heart to work. 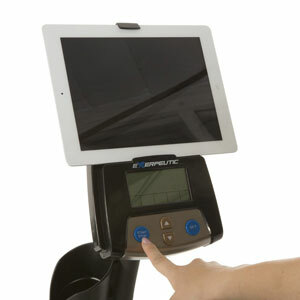 The console unit supplied with the Exerpeutic 2000 bike has quite a bit more to offer than the average fitness meter. First of all, as we’ve mentioned, it controls the resistance of the bike. However, it also offers 6 workout programs, which will automatically adjust resistance. These programs actually include 5 pre-set workouts (Intervals, Hill, Plateau, Climbing, and Valley), and a Custom User program which gives you the possibility to set values for time, distance, calories, pulse and resistance, for a span of 10 intervals. Your settings will be saved in the console memory. Evidently, there’s also a Manual mode, which allows you to adjust resistance freely, as you pedal. The console display indicates time, distance, calories, speed, RPM, pulse and of course, the current resistance setting. For time, distance and calories you can setup goals, and monitor your progress towards them. There’s also a SCAN function which cycles throughout the console values, displaying each one on screen for 6 seconds. In order for the pulse value to be indicated, you must hold the pulse sensors within the bike’s grips. The console unit is not telemetry enabled and cannot read pulse via a chest strap transmitter. The console is quite easy to operate. It features 4 buttons. The Start/Stop button turns on the unit and pauses it if needed. It can also be used to reset all the values on the console, by pressing and holding it for 3 sec. The Up/Down keys are for resistance adjustment in Manual mode, or for adjusting values for your goals. And finally, the Set button facilitates the navigation through the programs, and for confirming a specific value that you have inserted. Last but not least, the console integrates a tablet holder, which is placed above the display. Thus, a tablet fixed on the holder won’t cover your workout data. Some assembly is required for this bike. You’ll basically need to connect the two main frame parts together, connecting the pulse sensors wires. Then you’ll need to connect the bike’s bases, assemble and connect the seat, the console mast, console and pedals. There are quite several little parts to attach via screws and the whole operation may take up to one hour, one hour and a half. However, the manual will guide you step-by-step through the process. Also, the required tools for assembly are supplied. On the other hand, maintenance doesn’t require much at all. You basically need to remove the dust from the bike, and verify from time to time if all its bolts hold tight in place. The internal parts do not require any lubrication. Display doesn’t have backlight, and may be difficult to read in direct light or in case the room is a bit dark. The Exerpeutic 2000 magnetic recumbent bike, has quite a bit more to offer than a basic model, and for the array of features and functions supplied, this model comes with a decent price. Also, it features a sturdy construction, and superior comfort factors to other models in this price range. It’s a bike for light to medium cardio, the top resistance levels being actually quite tough, simulating a steep climb. 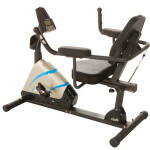 Thus, this bike is great for cardio training, stamina building, muscle toning, weight loss and even strength training. However, its lowest resistance settings are pretty light, offering low-impact workout possibilities for users who require recovery training. All in all, it’s a bike that offers great value for the price.